On your wedding day, you want to look fresh, fabulous, and flawless all day—from pictures to the ceremony to the reception and onto the honeymoon. That means your bridal makeup needs to stand up to the challenges of the weather, happy tears, kisses, toasts, dancing & more. The professionals at Salon Sleek know how important your big day is and can make you look and feel gorgeous throughout the day. Do a consultation and bring photos of bridal makeup that you like. Check out Instagram, Pinterest, magazines, or wedding blogs for ideas. Plan ahead. Are you going to go tanning or on vacation before your wedding? Looking to dye your hair? Have you had your bridal hair style consultation? All of these factors can impact your makeup. You want to ensure that the artist has the correct shades to match your complexion on the big day and that your makeup compliments your overall beauty look. Take test photos. During your consultation, have the artist or a friend take some test photos to see how your makeup looks in a photograph. Try to mirror different lighting conditions, such as outside, inside, and with/without flash. Opt for long-lasting looks. 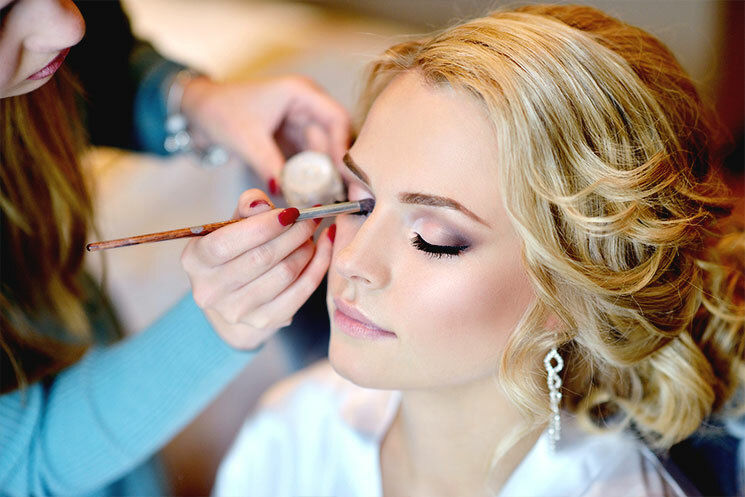 Your wedding day is a big fun day filled with lots of joy so you want your makeup last through it all. Choose products or techniques, such as foundation or airbrushing that can withstand both the weather and your event. Waterproof eye makeup. Waterproof eye makeup! You will cry happy tears at some point and don’t want your makeup running or smearing. Your whole eye from shadow to mascara should be able to stay put even if you tear up. Prime you pucker for perfect kisses. You will be kissing your groom (a lot!) and loads of family and friends so wear a lipstick that doesn’t dry out, crease, or smudge. Be sure to have a stick in your day-of bag just in case. The team at Salon Sleek has lots of tips, tricks, and advice for our bridal clients that helps make their wedding day a stress-free, beautiful event. Call us today to book your consultation and appointment so that you can look blissfully bridal all day!